I am nuts about nuts! One of my favorites is the pecan. This may be because my Grandpa had a pecan tree. 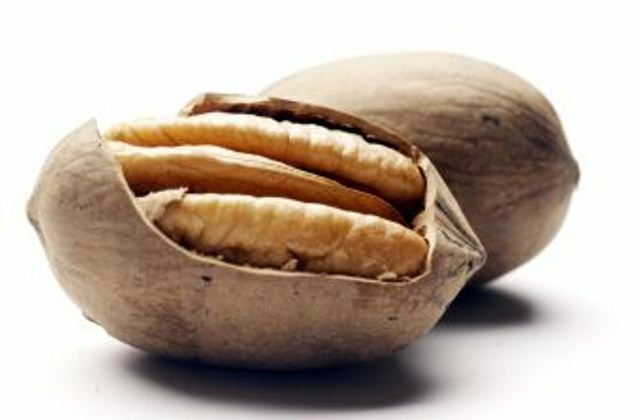 My dad would climb up into his big tree and shake all the shells down while screaming like a monkey and us kids would go around collecting them as they bounced to the ground. It is a fun memory that all the grandkids remember fondly. Grandpa Harold was a magician I think, because he could crack hundreds of pecans and they were always whole! 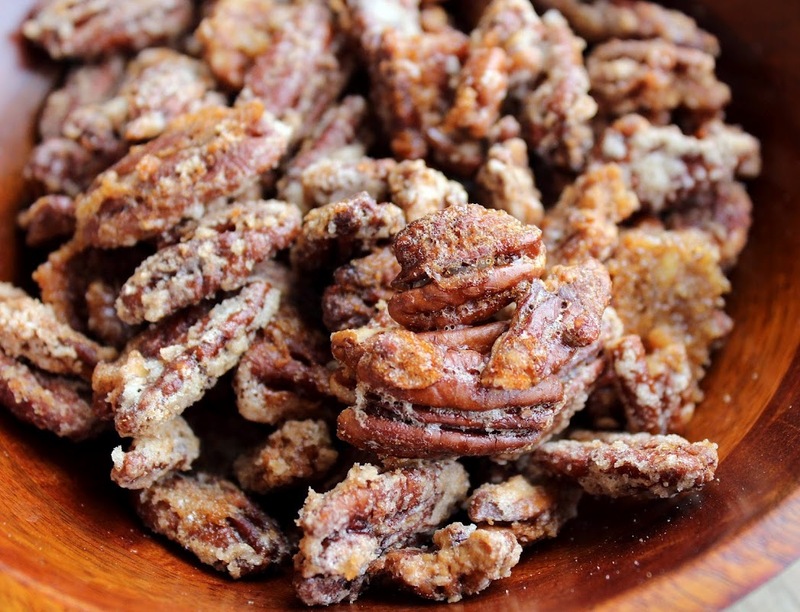 Have you ever tried to crack a pecan? It is really tough to not crumble the nut as you try to break it from it’s shell. He would send all of us big gallon cans FULL of perfect whole pecans he'd worked on. Now that I am older and know the degree of skill it takes to get those I really do believe he was a magician. My dad has carried on the tradition of nut loving in our family. During the holiday season we always had a big bowl of the variety bags of nuts with a nutcracker to break them open with. And now he owns a squirrel nutcracker that is out year round by a bowl of nuts to break open with the grandkids. So, I guess you could say I come from a long line of nuts :). We love them! From peanuts to pecans, from walnuts to cashews, every type of nut has such unique and delicious flavor. I am a huge fan of almonds as well and they are such a fun and easy nut to add to recipes or candy as a gift. There are many health benefits to eating more nuts. 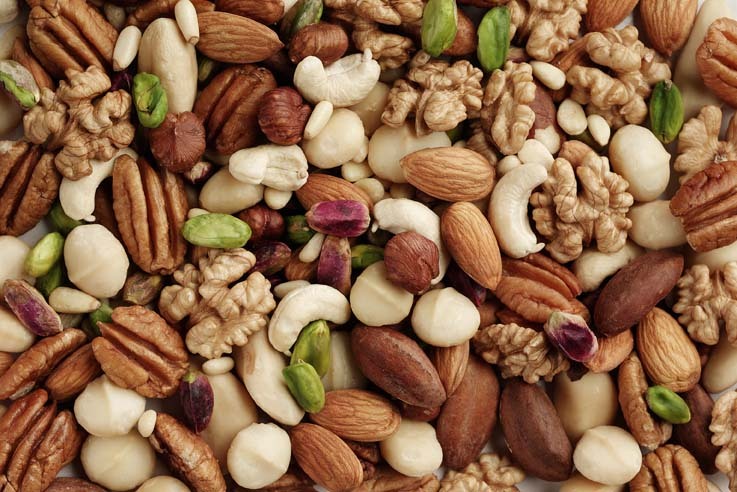 Besides being packed with protein, most nuts contain at least some of these heart-healthy substances: Unsaturated fats. A golf ball-sized portion (about 30g) of unsalted nuts makes a vitality-boosting snack and, unlike most other options, contributes a mix of valuable vitamins and minerals. All nuts have different nutrition credentials and will offer various health benefits. Almonds are rich in calcium and vitamin E. Cashews are a useful source of minerals like iron and zinc and are also rich in the mineral magnesium, which is thought to improve recall and delay, age-related memory loss. Pecans are a heart friendly nut, lowering cholesterol levels, prevent the plaque formation that causes hardening of the arteries and can help fight fatigue. Pistachios are especially rich in vitamin B6 which is important for keeping hormones balanced and healthy. And those are just a few in the long list of nuts. From eating them as a snack to tossing them in a salad, nuts are very versatile! Try adding more of them into your diet and to your meal plans and you’ll hopefully see a difference in your health. The recipe I share is not one that is really diet friendly, but I love to candy or season my nuts. This is a fun way to spice up a salad or ice-cream dish and is a great way to give as a thank you or gift. Making your own candied nuts at home is way cheaper then purchasing them at the store and it’s a fun process. There are so many versions and recipes of different spices and ingredients you can add to nuts. Some of my favorite markets in Seattle would have booths with candied nuts and they were always a huge hit! And the great thing is you can experiment with different kinds of nuts. Most that you see in the store are going to be almonds, but I decided to share one using my nostalgic pecans. Give this recipe a try and enjoy gobbling them up as snack, sprinkling them on a salad or sharing them with a friend! 2 Sprinkle the pecans on a large baking sheet in a single layer. 3 Roast for 8 minutes, stirring once. Remove pecans from baking sheet and place in a bowl. Set aside. 4 Generously butter the baking sheet. 5 Combine sugar and spices in a small bowl and mix until thoroughly combined. 6 Combine sugar mixture, vanilla, and water in a heavy-bottomed 2 qt saucepan. 7 Bring to a boil over medium heat, stirring until the sugar completely dissolves. 8 Continue cooking at a medium boil for five minutes. Remove from heat. 9 Stir mixture vigorously for 1-2 minutes until bubbling subsides. 10 Immediately add the pecans and stir until the pecans are coated. 11 Quickly pour the pecans onto the buttered baking sheet and separate with a fork. 12 Let cool for a few minutes before storing in an airtight container.